From Goodreads ~ Who knew a Cosmo quiz and a bottle of wine could change a woman’s life? Holly, housewife and frazzled mother of three, is determined to discredit the lackluster result of a Cosmopolitan magazine quiz. After buying a workbook geared toward helping her find her inner goddess, Holly sets off on a year of self-discovery, journaling through each exercise as she goes. Facing inner demons, yoga, an explosive colon cleanse and REALLY spicy curry, the lessons are hard on her emotions, not to mention her digestive system. But does she succeed in the end? Beyond the superficial, what important lesson does Holly’s inner goddess have the power to teach her… and what can Holly teach you? Holly is a stay-at-home mother with three children. Her husband, Shawn, has a successful job but is out of town a lot. Holly seems to have it all but she isn't happy with her life and consoles herself by eating and drinking way too much. One night she does a Cosmo quiz which reveals she has good taste but is shallow. 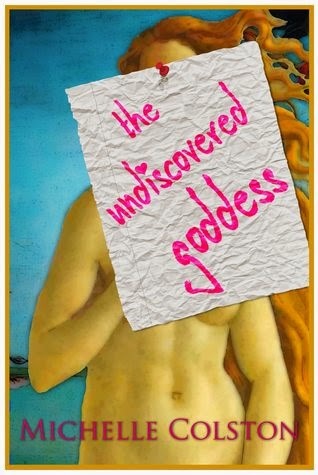 The Undiscovered Goddess is the workbook along with Holly's responses to the exercises, which is an interesting format for a book. This is the first book I've read by this author and I enjoyed it. It reads almost like a diary because Holly is doing the exercises along with documenting her thoughts and feelings. I liked the writing style ... it was funny, sarcastic and surprisingly honest (considering it's a novel). As a head's up, the language at times is for mature readers. I didn't find Holly all that likeable in the beginning but as she makes her way through the workbook and being challenged, I liked her as she changes and figures out who she is. Through her writing, we get to know her family (Shawn sounds like a hoot!) and friends. One of my favourite sections was when she had to do a cleanse (and later reporting back to the herbalist who sold it to her) ... it was really funny! I've done cleanses in the past so could relate. On another level, I found the workbook itself helpful. I don't think I could do the entire workbook (kudos to Holly for doing it even though there were times when she wanted to give up) but I did take away some things ... like being conscious of the crap you put in your body and having a ritual to treat/reward yourself. I've been thinking about doing a cleanse myself, so I would be interested in reading that part.